Submitted by witness on Tuesday, November 20, 2012. LOCATION DETAILS: Location is "ruralurbia" - Carroll county is farm lands interspersed with residential and horse property and also has a fair networking of wooded areas still intact. About 6 miles as the crow flies to the east is Liberty Reservoir, which empties into the Patapsco River. Immediate "neighborhood" is mostly large residential and many wooded properties, we ourselves have horses on 17 acres that is 1/2 wooded with a creek bottom and a rather constant deer herd. OBSERVED: 11/20/12 I have been keeping my eyes peeled for any potential sign even though I live in a fairly populated area. I live on and drive up and down Carrollton Rd several times a week. What I noticed was a fresh break of a young tree, about 50-60 feet in from the road. Due to brambles, and being private property, I didn't go in for exact measurements but I'm a pretty good estimator. This break is about 6 feet off the ground, maybe 5, the tree is approximately 4-5 inches in diameter. I noticed that there are significant scrape marks on one the road side of the tree, can't see the other side, The marks are ONLY below the break. I also found what looks like definite depressions in the leaf litter, with a bit of compressed bare ground, one about 6 feet in from the road at the tree line, and one about 2 feet from the guardrail. I carry a tape measure with me in my car as part of my tools for farriery, so I was able to lay it out at what I believe is the length of the depressions and get pictures. Of course I couldn't resist doing a few knocks, there were some good rocks at the roadside so I did one knock, waited about 10 seconds then did two more about 2 seconds apart. I waited about two seconds, stood up, took two steps and heard a response knock!!! It sounded like it was certainly past the hill (top is about 3-500 yards from road) and probably well past that, guessing within a half mile. I waited about 30 seconds, put out a few more knocks, nothing. Couldn't help a few short whoops, no response. ALSO NOTICED: We usually have a lot of foxes around, but except for about 6 nights ago when a vixen was having a romantic evening, there has been little in the way of fox activity for over a year. We had at least two fox dens with kits on our property 2010 and '11. I did check with my husband, he said that a tree this size would not be broken by a deer, and the lack of scrape marks above the break is un-deer-like too. OTHER STORIES: I haven't heard of incidents around here but I am really new at this, and I am going to google this area for activity. ENVIRONMENT: Carrollton Rd runs a bit east-west at this point, tree break and depressions noted on north side of road, which is a very large (30+? 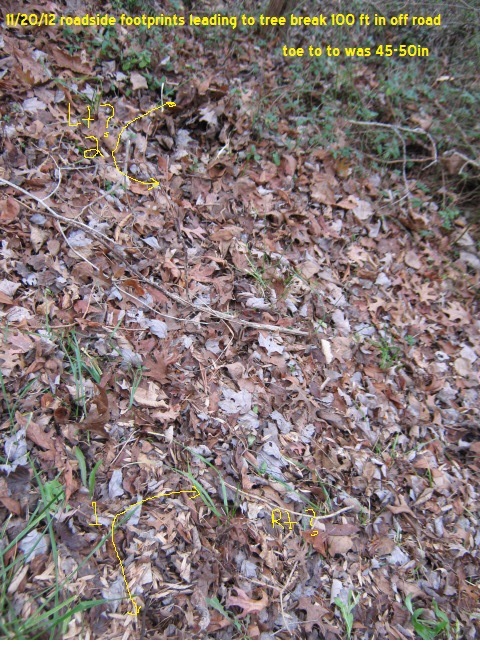 acres) wooded private property, deciduous, lots of leaf litter. Thin brambles at tree line which is about 6-8 feet in from road, then the terrain is sparse undergrowth, with obvious (to me) deer/animal trails but no human made trail. South side, where I parked, has a bank upward about 7 feet (varies) and there is a line of planted pines. Walking up the road about 50 feet and looking around the south side, I did notice a big lay of fallen timber, several old 8-16 inch trunks together that would possibly make a hiding place if needed. This area in general is full of little gully creeks and feeder streams. Despite the presence of homes, I do not find it inconceivable that we may at least have some intermittent squatch traffic around here. The witness noticed the tree break and stopped to investigate. Noticed imprints of large human-shaped footprints in the wet leaves that blanketed the woodland's floor heading towards the tree break. Although there isn't any discernible definition each of the tracks was approximately fifteen inches in length and about half as wide with a four foot stride between them. After investigating the break and the prints, the witness couldn't resist clacking two rocks together. The witness was surprised to get a response in the form of two knocks in return. After talking over the phone and having spent a few hours in person with the witness, I found the witness to be quite credible and sincere. 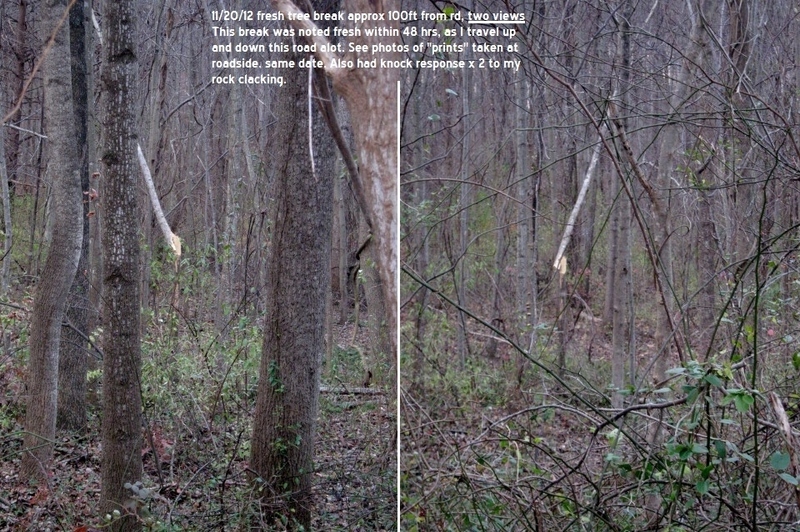 Here are the pictures that the witness took that day. The captions and commentary are by the witness.